Wader Quest: Another incredible day! 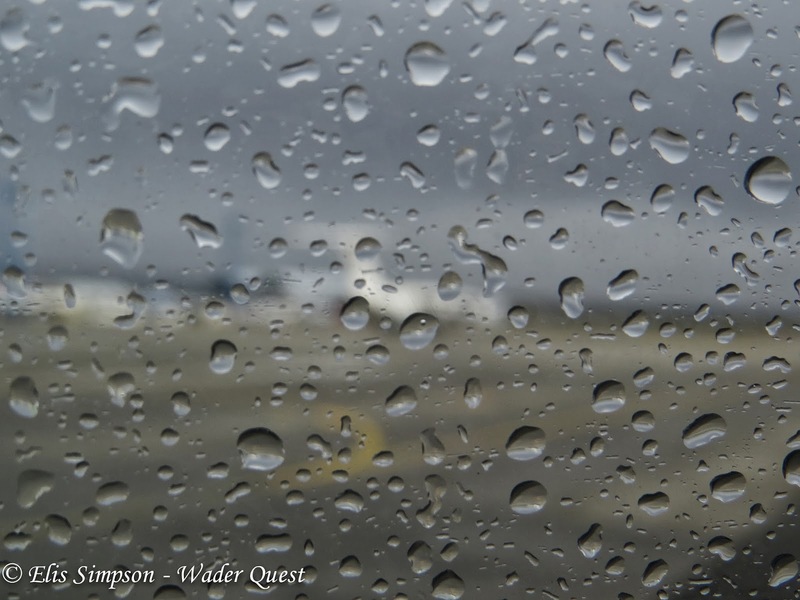 A travel day turned into a ticking bonanza for us. 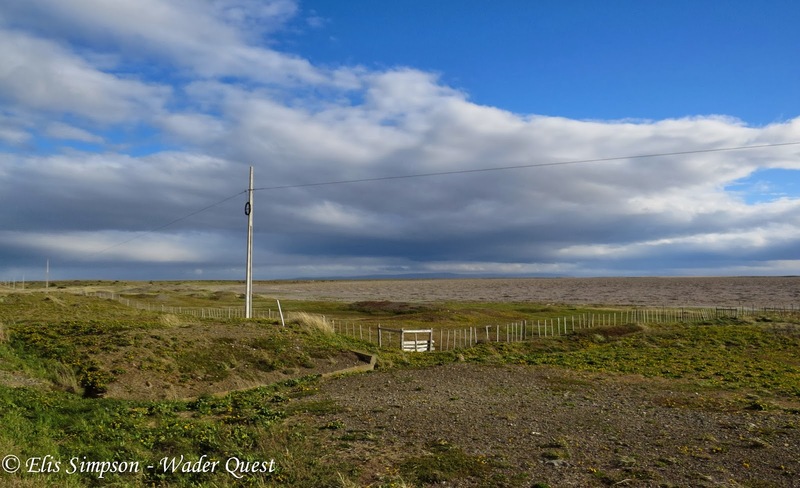 The plans I had made were for us to travel to Punta Arenas and settle in and perhaps do some birding with the possibility of picking up a non Wader Quest bird or two. But after checking-in to our hotel, the need look for our target species, coupled with some fresh information gleaned from Ricardo Matus last night while we were visiting Diego and Sole Quevedo of Aves Playeras and sharing a libation or two, got the better of us. We headed for Laguna de Los Patos, which you'll find hard to locate on a map. We got out of the car and the wind that had made our landing rather more exciting than I would have liked, had grown into a full glown gale. It wasn't gusting, it was a constant stream of cold air buffeting us to the extend that it was nearly impossible to stand still, lift your bins and look at a bird. Nevertheless see birds we did and somehow, with me acting as a wind break, Elis also managed to keep the camera still enough to get some shots. The first excitement was finding Two-banded Plover, although in the end they turned out to be extremely common at the Laguna, seeing the first one is always a thrill. They are stunning little plovers with their smart bands across their chests. Two-banded Plover Charadrius falklandicus; Laguna de Los Patos, Punta Arenas, Chile. 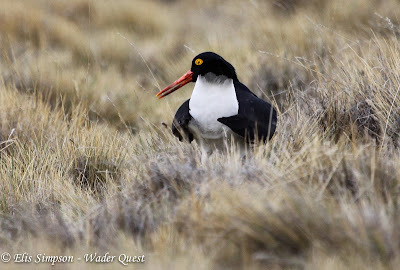 The next delight for us was Magellanic Oystercatcher. These birds are relatively common but we only saw two pairs at the Laguna. 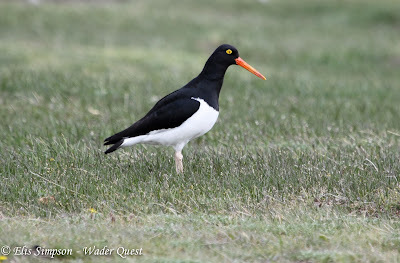 The impression is that they are typical pied type oystercatchers when you first see them, but on closer inspection their striking yellow eye and orbital ring set off the black and white plumage rather well. Unlike other American oystercatchers their backs are black like the head and neck, and not brownish. Magellanic Oystercatcher Haematopus leucopodus; Laguna de Los Patos, Punta Arenas, Chile. Magellanic Oystercatcher in flight showing the distinctive wing pattern. 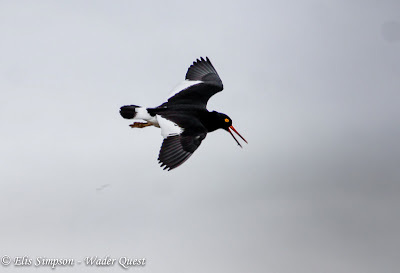 They also have a unique (to oystercatchers) display where they raise their tail and call, the call itself is not quite like the typical piping of other oystercatchers which to my ears all sound very much the same. The sound is like a plaintive high pitched whistle, sometimes bi-syllabic. Magellanic Oystercatcher Haematopus leucopodus; Laguna de Los Patos, Punta Arenas, Chile. This bird is displaying with its tail cocked but to me in this photo it looks for all the world like a portly gentleman in a tux holding his bloated belly! Or, possible some strange looking penguin. 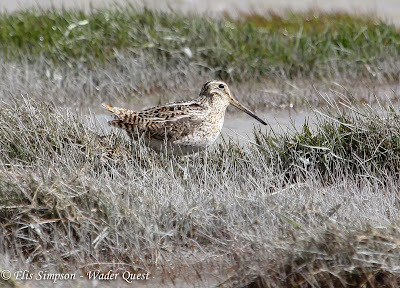 We then came across a snipe. At the moment this bird is a South American Snipe but we read with interest in the Alvaro Jaramillo's excellent book that there is some evidence to suggest that these could be split at some stage due to differences in voice and display, so it was particularly pleasing to find one so easily. South American (Magellanic) Snipe Gallinago (magellanica) paraguaiae; Laguna de Los Patos, Punta Arenas, Chile. A potential armchair tick of the future. "I think I've got one on this first corner, but I can't hold my bins still enough to be sure!" I looked and thought she was right, but we needed to get much closer before we could be sure. 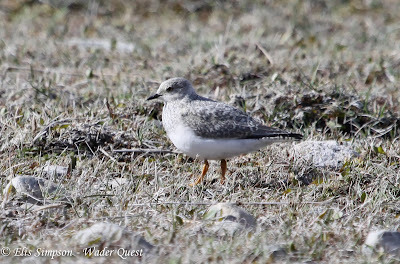 Now, what I am about to say is going to sound a little churlish, but I was disappointed to find that although this indeed was a Magellanic Plover, it was an immature bird not the gorgeous adult I was hoping for; talk about ungrateful eh? 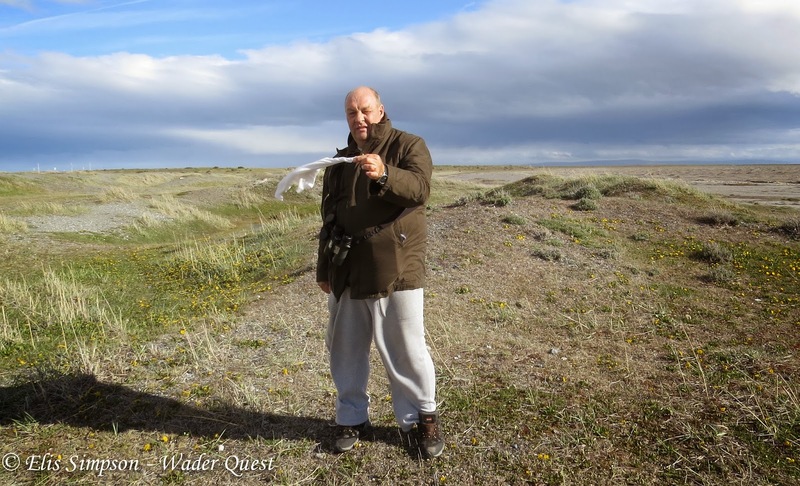 Here I was looking at one of the rarest and most sought after birds at the end of the world and I was disappointed. The photo of it belies the difficulty we had to simply watch this bird, how Elis manages to capture these images under such extreme conditions I'll never know, but I'm glad she does. Immature Magellanic Plover Pluvianellus socialis; Laguna de Los Patos, Punta Arenas, Chile. 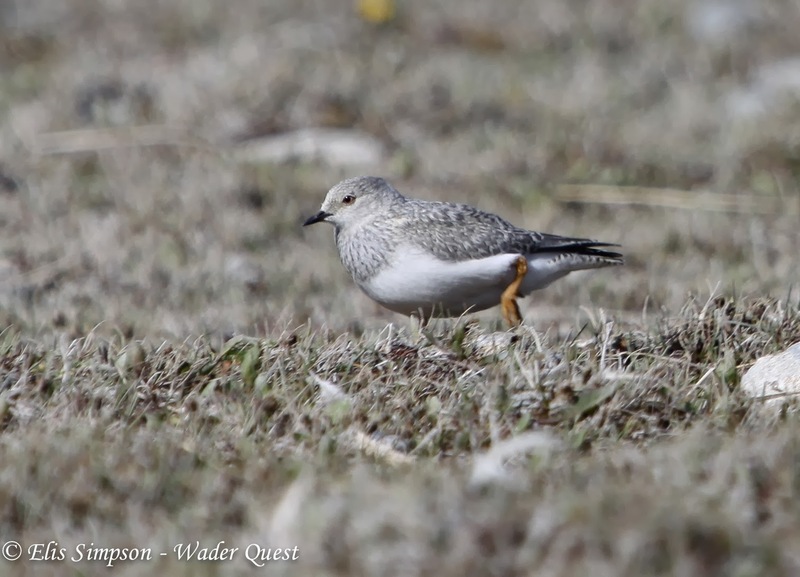 So by the end of the day we had actually caught up with 3 of the 4 species we were looking for in the region, not a bad start and the most difficult, the Magellanic Plover was under the belt. 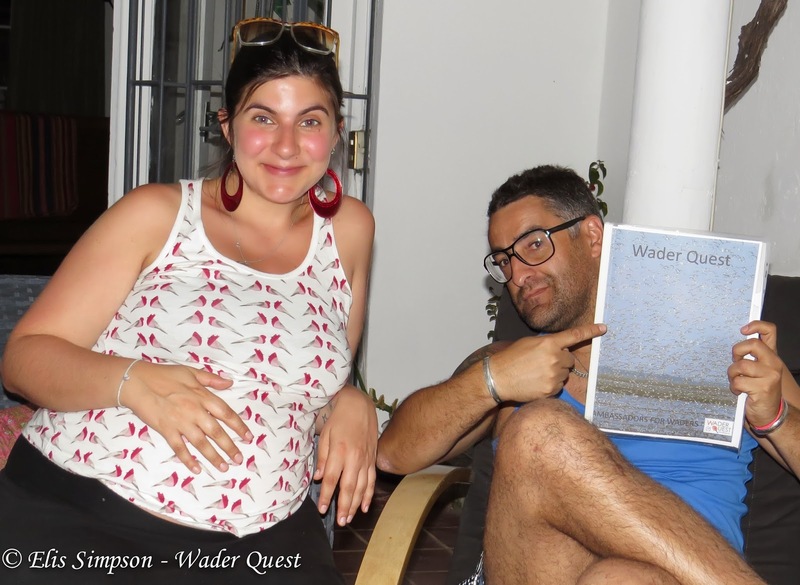 Sole and Diego with the Wader Quest information pack. 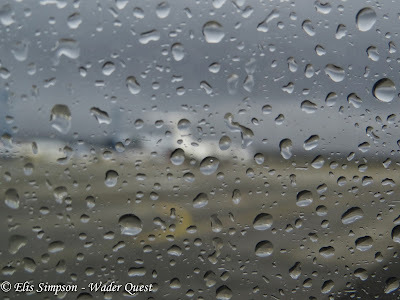 The sight that greeted us from the aircraft window in arrival at Punta Arenas. Not promising! Me trying to demonstrate the force of the wind using my handkerchief. The view across Laguna de Los Patos from where we parked the car. The thin band of land you can see on the horizon is where we had to walk to around the lake. I hope you have the chance to visit the King Penguin colony while you are in Tierra del Fuego. HiDavid. Thanks, yes we did see the King Penguins, but were astonished at the entry price of 15 GBP equivalent, especially as you could see them from the road!. Hi there - great post! All kinds of waders I have never seen! 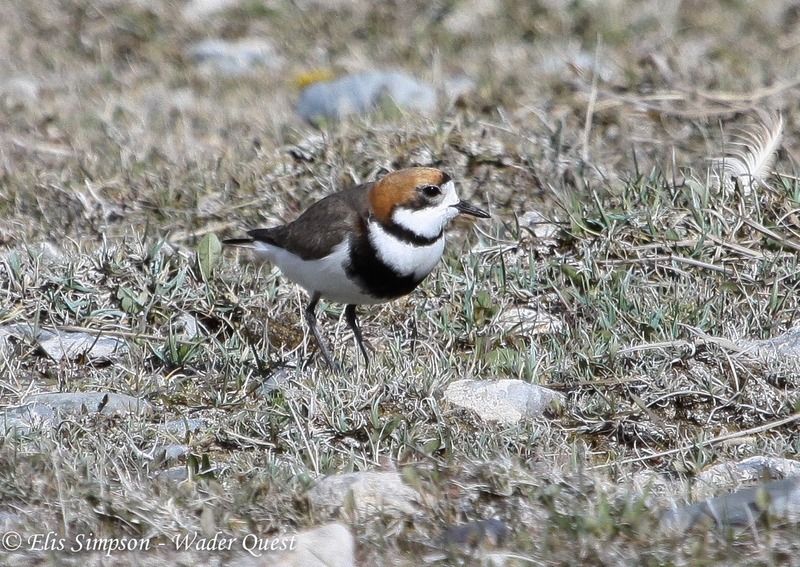 This would be a great post to link to Wild Bird Wednesday that runs each week on my blog from Wednesday (!) to noon Saturday - please feel free to link this and other posts! Hi Stewart, we'll be in touch when we get back from travelling.